Promise Rings, Purity Rings, Engraved Gifts, Ring Inscriptions etc. Although I strongly disagree with those who believe that only precious metals, preferably gold, should be used for purity and promise rings (these terms are sometimes interchangeable, but a promise ring can apply to keeping any sort of promise, noble in nature, in most cases), there is a natural tendency in us to ascribe very high value to gold. This results in a subconscious belief that the value of the material will somehow “rub off” on the wearer, making her or his commitment more enduring and steadfast. But what about the color? What implications are we creating by choosing a particular metal for a meaningful ring? White is the color of purity and chastity. There is hardly anyone who does not know that, as this symbolism comes very naturally. This makes white gold and silver ideal for purity rings. It is also important to remember that the lack of traditional golden color implies not cheapness, but modesty. But purity is not the only meaning of white. This color also indicates a new beginning, clarity of mind, purified thoughts and actions – qualities that broadly conform to the aspirations of most people considering a purchase of a promise ring for themselves or for someone else. White can also mean bodily cleanliness and therefore health – this brings up another important commitment to oneself. Well, there is nothing wrong with gold, of course 🙂 But doesn’t it seem that the color of gold signifies personal success, security, high status, power, confidence. (gold is also the color of the sun, which adds imagery of good health). These qualities, in my humble opinion, indicate the result of someone’s efforts, other than the present efforts and commitments. 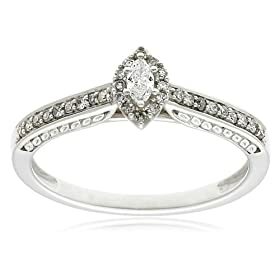 Given these considerations, it would seem that silver and white gold are ideally suited for purity and promise rings. Yellow gold, however, definitely has its place in jewelry! There is a misconception regarding what white gold actually is. One must be aware of the fact that white gold is not some sort of specially processed or rarely find metal. Yes, some people do believe in that kind of nonsense… White gold is an alloy of gold and one or more white metals, such as nickel or palladium. If any consolation is required, yellow gold is also usually used in jewelry as an alloy, because pure gold is a rather soft metal. Previous post: Diamond Ring Wrap for your Engagment Ring: What are the benefits?